THIS picture was sent to us by Meiji Techno, which has just commissioned a new suite of 365 microscopes at the University of Liverpool, UK. The university’s new central teaching laboratory was opened last month, October 2012, just in time for the new academic year. Given the substantial investment made by the university in its new state-of-the-art labs, you might think that the press release would be accompanied by images of smiling students getting to grips with their new kit. I mean, 365 brand new microscopes – that’s pretty impressive. The 170 workstations in the lab each have video and computing capabilities, and the microscopes are equipped with Lumenera cameras. The university proudly boasts that this makes it the most advanced and largest light microscopy teaching facility in the UK. Altogether, it looks like a pretty cool set-up. Judging by this student’s demeanour, however, all might not be well at the university. Maybe he’s still suffering the after-effects of Fresher’s Week, or perhaps he’s just camera shy. 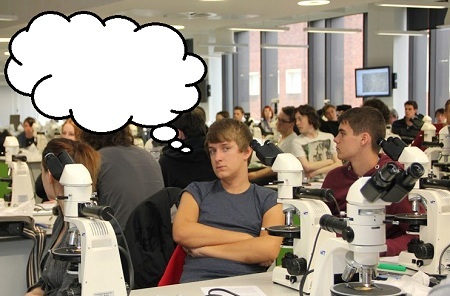 We at LabHomepage wonder if our readers have any better ideas about what is passing through the young man’s mind, and invite entries for our caption competition. There are no prizes other than the inestimable prestige of contributing to this august website, the world’s leading news channel for laboratory equipment, but that should be enough for anyone. To enter, simply use the ‘Leave a Reply’ facility below.